With the recent airing of the Third Equestria Girls movie, I've decided to write my own one. However, that story was already in producing, and atm it is not even 10% done! Just letting you guys know that I'm working on it, so that you'll not think that I've commited suicide because of some bad comments. And finally, my EG story WILL feature the three Cyberponies Jay, Rick and Gary. It will be called 'Cyberfall'. The portal between the human world and Equestria run's, or ran, on the lunar cycle, sort of. So, who's to say that the Rainboom's Equestrian magic doesn't react to the lunar cycle in its own way. If you use this concept in one of your own fics, or you know of a fic that already uses this concept, please link me to it. The other day, I binge-watched the latest batch of Equestria Girls minisodes, which can be found (if you live in the US) on the Discovery Family Go app. Otherwise, you'll have to hunt them down piecemeal on Youtube. 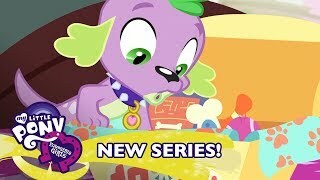 As we continue waiting for the new series on YouTube to start, I have a review on Rainbow Rocks. The second film is hailed by many Bronies to be the best one in the series. As you already know, this stars the Dazzlings as the new threat while Sunset continues to struggle through her redemption. Just so you know this won't be a spoiler for the movie so don't worry. I loved it and the end leads to either another movie or an Equestria Girls show. I am hoping for the show. I don't know what amuses me more: that Spike is a YouTuber, that Spike has crazy expensive tastes, or that Spike is ordering swag boxes from Japan. Also, that last bit is a bit of a wink-nudge to the periphery demographic, given the dirty sock inside. This one was fun and silly. Good start to the new season. Did I beat Summer Dancer to it this time? So there's another new beach short. This one has Twilight, Pinkie, and Rarity on a sailboat. In which Sunset Shimmer goes back to Equestria! So, I've watched the newest batch of Equestria Girls digital mini-episodes. They were pretty fun! And I thought I might share some of my thoughts on them. This is less of a "review" and more a set of thoughts I had when watching the shorts, or stuff I thought about them. - Flash's new look is... all right. I like the jacket okay, but I actually kind of miss his spiky hairdo. Just a couple of days left until the new YouTube series starts for Equestria Girls. As we wait, I have a review of Friendship Games posted already and it continues from Rainbow Rocks a few months later. The girls head into a competition with CHS's rival school called Crystal Prep and face not only the Shadow Bolts but this world's Twilight. While scrolling through Netflix, I have discovered that the first Equestria Girls film has been dropped from their listings. Hopefully they'll put it back up, but I'm worried it might be permanent. Just wanted to give you a heads up that as part of my December Debauchery plan, this week we're doing all Equestria Girls stories! A new story every day, starting yesterday with a fresh chapter of A Little Dash Will Do. This'll run until Sunday, so buckle in and get ready to see what those sloots at CHS get up to! And make sure to follow me on my brand spanking new Twitter!